Toby is in the news again! 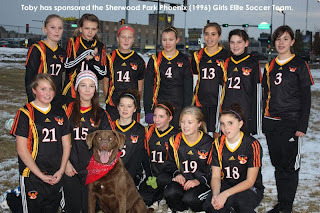 Toby has sponsored the Sherwood Park Phoenix (1996) Girls Elite Soccer Team. Toby loves to play ball, loves to play goalie and this was a perfect fit! 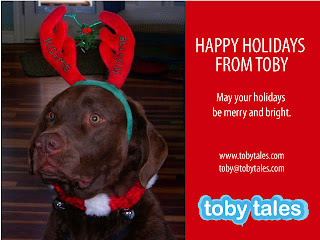 Check out the photogallery at http://www.tobytales.com/ for more photos. Toby attended his own book-signing/paw-printing event at Chapters Book Store in Sherwood Park on October 10, 2009. Toby enjoyed visiting and playing with everyone who stopped by to meet us. A big thank you to everyone who stopped by to visit and support us! See the photos in the photo gallery. NEW BOOK "On Toby's Terms" - Watch For Details! Charmaine and Toby's new book "On Toby's Terms" will be published in 2010. Watch for details! 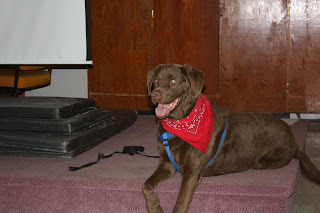 Toby continues to thoroughly enjoy his volunteer placement with Alberta Hospital Edmonton. It is clearly the highlight of his week. Toby and Charmaine were awarded the "Reese Award"! Toby and Charmaine were awarded the "Reese Award" by the CHIMO Animal Assisted Therapy Project in appreciation of volunteer service. This award is named after Reese, a Great Pyrenees who was a certified animal therapy dog with CHIMO and volunteered at Alberta Hospital Edmonton for two years before he passed away from bone cancer. Reese made an indelible mark on everyone who knew him.